UAJCA new manager Richard Craddock announces his 18-player squad for 2019. In 2019 as in the last couple of years, UAJCA will operate with two hard-ball teams in the development matches and one team in the Yorkshire Festival fixtures. New kit pictured left. 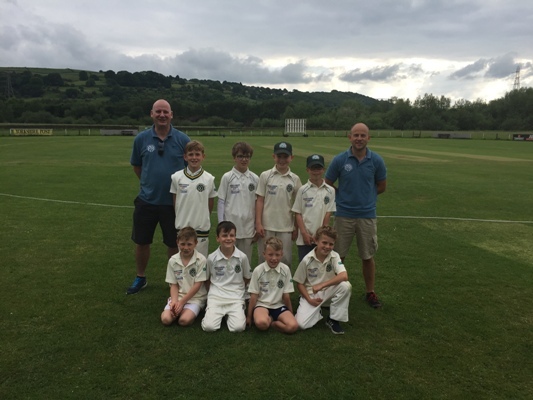 Max Bailey [Crossflatts], Joshua Barton [Steeton], Archie Cox [Steeton], Ava Craddock [Earby], Zach Day [Steeton], Archie Dobson [Oakworth], Freddie Greathead [Oakworth], Callum Hardy [Sutton], Brandon Howie [Sutton], Louisa Hutchinson [Steeton], Sulaiman Mahmood [Wilsden], Freddie Padgett [Wilsden], Joe Powell [Oakworth], Phoebe Raby [Oakworth], Seth Rawlinson [Earby], Harry Robinson [Oakworth], Milo Robinson [Earby], Max Wilkinson [Crossflatts]. Congratulations to all squad members. UAJCA have been drawn with Huddersfield and Barnsley Districts CC in the 2019 Yorkshire Festival. The mini-tournament will take place on Sunday 2nd June in Huddersfield [Venue TBC]. An 8-player team will play each of the other 2 teams with the overall winner going forward to the County Semi-Finals & Finals day on Sunday July 14th 11:00am start. Skipton CC in conjunction with Skipton CI CC will stage a second Festival in 2019. July 28th [10:00-16:30] will see a first ever Festival solely for under-9s at Representative level. Four Districts [inc UAJCA] will bring an 'A' and a 'B' team for an 8-aside tournament with 6 matches for each team. Huddersfield and Nidderdale have already agreed to compete whilst a fourth District is still be sought. 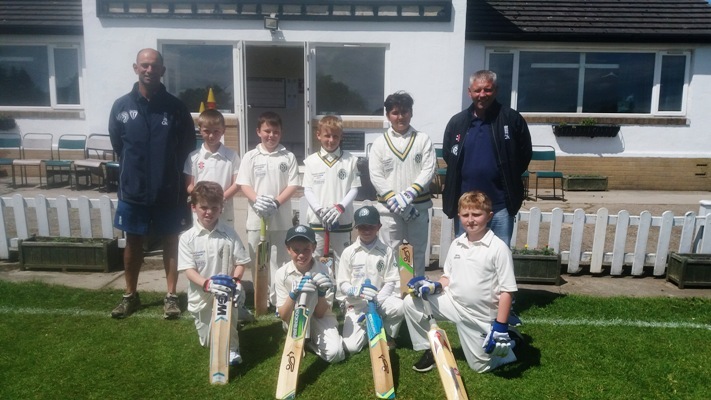 UAJCA' under-9 A team won both their matches at Pannal CCC vs Nidderdale whilst the 'B' team had one win and one loss in a very successful run out for our youngest squads. See scorecards to right. The 'A' team accumulated 225 runs [190 from the bat] for the loss of 11 wickets, an excellent average of 11.9 per batsman's innings. For the 'A' team Ryan Lee led the batters with 25 + 23. Huw Pacey was also on form with 12+22 [out once]. All belied their years and Alex Hall chipped in 11+18 [out twice], Noah Kennedy added 12+9 [out once] and Joe Powell 8+14 [out once]. These performances augur well for 2019 when some of these players will be under-10s playing standard 11-man cricket with a hard ball. The managers learned much about all 16 players. UAJCA's first game of the day saw them Bat first against Huddersfield, our opening batsmen got us off the mark with Alex Hall making 10 & Noah Kennedy making 5 after an unlucky run out chasing a quick single. UAJCA second pair Sam Stoneman & Ryan Lee managed to put on an additional 17 runs but again suffered an unlucky run out. Charlie Price & Freddie Ward steadied the ship managing to keep out the Huddersfield bowling attack and add a few runs to the score and finally Huw Pacey & Joe Powell came in. Huw was caught out by a slower ball which took his wicket but the pair soon settled down and managed to grab runs with Joe playing an excellent late cut to grab a 4 off the final ball. Players please bring packed lunches & drinks for the day. Manager Mark Stoneman reports the 4 warm-up matches with Huddersfield went very well on a very hot afternoon for the teams. The matches were all very close and our squads played well together. Bowling attacks were effective in both games, batting became more established in the 2nd match as the squads & pairs learned to play together. It was a very hot afternoon with no shade for the players so they all did well to keep going. They worked very hard for a proud coach. It was very encouraging for the Yorkshire Festival matches at Airedale CC on 3rd June. Freddie Best [Skipton], Ava Craddock [Earby], Freya Craddock [Earby], William Dyson [Wilsden], Edward Fordham [Oxenhope], Alex Hall [Earby], Ben Jolly [Earby], Noah Kennedy [Skipton], Ryan Lee [Skipton], Huw Pacey [Wilsden], Joe Powell [Oakworth], Charlie Price [Skipton], Jack Richmond [Wilsden], Milo Robinson [Earby], Sam Stoneman [Sutton], Freddie Ward [Earby]. The standby reserves will be Oliver Bija [Oxenhope], Freddie Padgett [Wilsden] & Archie Ward [Crossflatts]. Further players may be added dependent on cover for holidays etc. The Yorkshire Junior Cricket Festival committee has awarded the group qualifying competition in 2018 to UAJCA. The event will be held at either Airedale CC or Bingley Congs CC [dependent which club loses in their Wynn Cup-tie on 13th May]. It will be held on Sunday 3rd June [commencing 11:00am] and will include teams from Upper Airedale, Huddersfield and Nidderdale. The competition winner will progress to the County Finals day on 1st July. A-W batted first scoring 294-4. Tom Raby 1-7, Ed Whaley 1-11, Alex Hall 1-15, Eshaan Lodhi 1-27. Several run-outs were missed and 3 catches not taken by our boys. 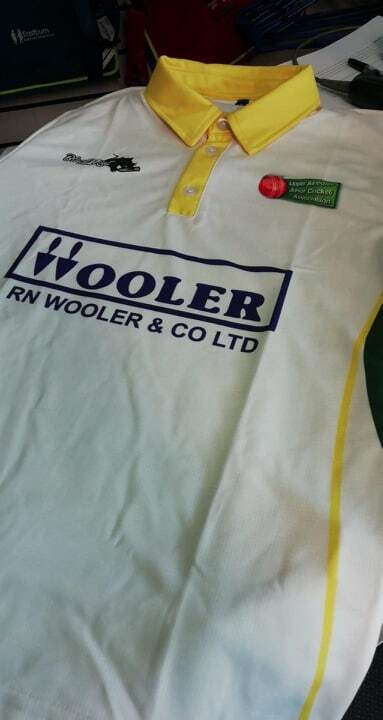 In reply UAJCA reached 204-6 with our highest score by Ed Whaley with 6. Aire-Wharfe bowled and fielded well. Bradford also batted first scoring 238-4. This time Captain Joe Birks with 2-3 led our bowling with Ed Whaley 1-3 and Tom Raby 1-5. With the bat we got 268-5. Thomas Durn shone with 11no whilst prominent Ed Whaley had 9no. Eshaan. Lodhi tallied 19 but was out twice, Harvey Green scored a fine 13 but was out once. As Aire-Wharfe also defeated Bradford, they go forward to the semi-finals. We finished second having made progress but having been slow out of the blocks early on. It was a great learning experience, well done boys. Ahead of next week's tournament, Managers Ji & Steve had tough decisions to make in selecting a final squad after some great performances and games against Huddersfield. Following a successful trial at Bradley, team manager Ji Mukherjee announces the following squads to face Huddersfield at Skipton. Joe Birks [Capt], Tom Chapman, Harvey Green, Alex Hall, Thomas Durn, Eshaan Lohdi, Ed Whaley & George Kitson. Joe Horton, Rhys Mazey, Caleb Gledhill, Sam Stoneman, Tom Raby, Lewis Holgate, Alex Byrne & Faisal Sheeraz. These two matches will help Ji & Steve determine the UAJCA team to play in the under-9s Yorkshire Festival on 4th June at Baildon CC. The first round venue for the inaugural under-9 Yorkshire Festival has been announced as at Baildon CC. The 1st round on 4th June will unfold at 11:00am against opponents Aire-Wharfe and Bradford Leagues. Refreshments will not be provided so packed lunches should be the order of the day. UAJCA under-9s 8-man team will be announced by team managers Steve Powell & Ji Mukherjee after warm-up matches with Huddersfield on 28th May. The inaugural UAJCA under-9s Yorkshire Festival team is now taking shape. Managers Ji and Steve have nominated the following 16 players to participate in the 'A' vs 'B' match at Bradley on 21st May. The two-team squad is Joe Birks (Capt), Thomas Chapman, Tom Raby, Thomas Durn, Harvey Green, Alex Hall, Joe Horton, Ed Whaley, Eshaan Lodhi, Ryan Lee, George Kitson, Noah Kennedy, Rhys Mazey, Caleb Gledhill, Sam Stoneman & Theo Green. In addition the following players are named as standby reserves: Lewis Holgate, Charlie Price & Faisal Sheeraz. Alex Byrne, who was unavailable will be considered once form is established. UAJCA is to enter the new YCB under-9s Yorkshire Junior Festival in its inaugural year . The competition will be in 'festival' format with groups of 3 teams meeting at one venue and playing each other [2 matches per event]. The teams will comprise 8 aside and play hard-ball Pairs cricket. Provisional dates are shown in the fixtures panel [right].